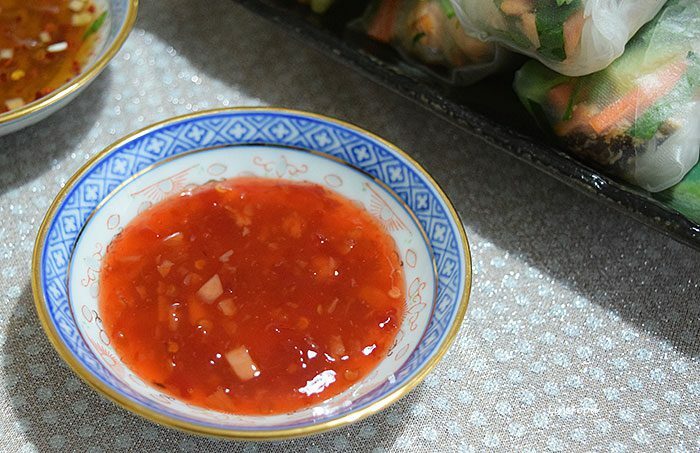 Sweet Chilli Sauce is one of those ubiquitous sauces sold in bottles or jars as either Chinese or Thai. It is what it say – sweet and not spicy, so the chillies used are usually the milder variety. But of course, that doesn’t mean that you can’t make it sweet and spicy! When I was growing up in Singapore, this was often served as a dip with savoury snacks in the afternoons. It’s still one of my favourite nostalgic indulgences. Fantastic as a dip with spring rolls and prawn crackers but also makes a great base or topping for little canapés. See the Amuse-Bouche and Canapés page for ideas. Mix everything together in a saucepan on medium heat and bring to a simmer. Lower heat down and continue to simmer for 10 minutes until it's thickened. Check seasoning and that’s it!